Call the Clinic to schedule your next appointment. 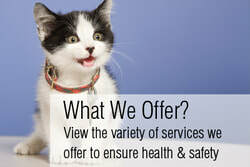 Recommended Heartworm and Flea & Tick Prevention Available. Find our featured Animal Hospital in Pets, Animals and ﻿Pet Grooming & Boarding﻿ featured as a Aurora Business in the York Marketplace.